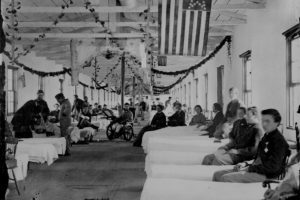 “Crossing” the West Coast Premiere from LA Opera is inspired by poet Walt Whitman’s experiences working in military hospitals during the Civil War. His diary is a messy compilation as a volunteer nurse. 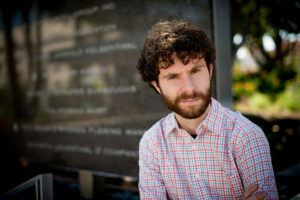 His personal and loving connection to each patient in the hospital is what attracted Matthew Aucoin (composer, librettist and conductor) to the piece. Crossing explores how the individual experiences of soldiers are remembered and told. As Whitman listens to wounded veterans share their memories and messages, he forges a bond with an enigmatic soldier who forces him to examine his own role as writer and poet. Whitman best known for his poetry work “Leaves of Grass” left behind in his diary what Aucoin found as treasure and inspiration for his fictional portrayal in this operatic fantasia that asks in the very first line, from Whitman’s poem “Crossing Brooklyn Ferry”: “What is it, then, between us? Matthew Aucoin shares Whitman’s opinion on opera. Whitman considered opera the pinnacle of human expression, something beyond the powers of language alone. And in his best poems, Whitman operates like an opera composer: he carries the English language into a new musical landscape. Whitman’s “melodies” surge boundlessly, spilling over the side of the page; his exclamations are wild and craggy. His poetry is both the waterfall and the rocks on which the water crashes. “What is it, then, between us?” With this resonant question at the climax of “Crossing Brooklyn Ferry,” Whitman asks many things at once: what is his relationship to his contemporaries, his fellow men and women? What is his relationship to you, the reader, whoever you may be, whenever and wherever you may be reading his poem? And what is the relationship between the contradictory elements of his own self? The phrase “between us” itself has a double meaning: what is the relationship between us, and what stands between us, keeping us apart? Baritone Rod Gilfy performs the role of Walt Whitman in LA Opera’s 2018 performances of “Crossing”. LA Opera Off Grand presents “Crossing” on the following dates. Running time: one hour and 40 minutes, performed without intermission. Tickets still available to see this performance at the Wallis Annenberg Center for Performing Arts (9390 North Santa Monica Boulevard, Beverly Hills, 90210).